Leigh first met Jason at an audition for a tragic play. He was nineteen and troubled and intensely magnetic, a dead ringer for James Dean. Leigh was twenty-two and living at home with her parents, trying to figure out what to do with her young adult life. Within months, they had fallen in love and moved to New Mexico, the “Land of Enchantment,” a place neither of them had ever been. But what was supposed to be a romantic adventure quickly turned sinister, as Jason’s behavior went from playful and spontaneous to controlling and erratic, eventually escalating to violence. Now New Mexico was marked by isolation and the anxiety of how to leave a man she both loved and feared. Even once Leigh moved on to New York, throwing herself into her work, Jason and their time together haunted her. Land of Enchantment lyrically explores the heartbreaking complexity of why the person hurting you the most can be impossible to leave. With searing honesty and cutting humor, Leigh wrestles with what made her fall in love with someone so destructive and how to grieve a man who wasn’t always good to her. Leigh Stein is the author of the novel The Fallback Plan, which made the “highbrow brilliant” quadrant of New York’s “Approval Matrix,” as well as a collection of poetry, Dispatch from the Future, selected for Publishers Weekly’s Best Summer Books of 2012 list, in addition to the Rumpus Poetry Book Club. Her nonfiction has appeared in Allure, BuzzFeed, Gawker, The Hairpin, The New York Times, Poets & Writers, Slate, The Toast, and xoJane. Formerly an editorial staff member at The New Yorker, she currently lives outside New York City and codirects the nonprofit organization Out of the Binders, which advances the careers of women and gender-nonconforming writers through conferences called BinderCon. For her advocacy work, she has been called a “leading feminist” by The Washington Post, and honored as a “woman of influence” by New York Business Journal. "Leigh Stein’s Land of Enchantment is a thoughtful and compelling elegy to a troubled man, a broken love, and a broken dream of the west. It’s about loss, wonder, and the vexed grip of attachment. It grieves by way of admitting complexity—by answering the late-night knock of unfinished business—and its spell is immersive: Once I’d picked it up, I did not set it down again until I’d finished it." "One of the most compelling memoirs I've ever read. A mesmerizing requiem on loss and love, Stein's intelligent ode to adolescent obsession is unflinching in its honest portrayal of what it means to give ourselves over to the dark side of love. This is a glittering gem of a book." 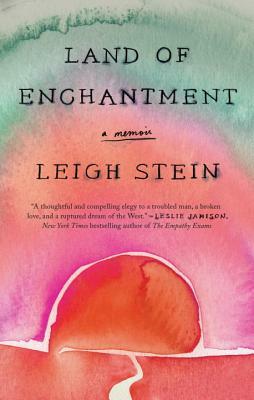 "In Land of Enchantment, Leigh Stein examines every cruelty and humiliation of her obsessive first love with bold intelligence and uncommon grace. A riveting, fiercely honest story about how a smart girl from a good family can fall into darkness this deep." "Leigh Stein has written an engrossing account of young love, the lesser-told kind, whose enchantment is more poison than panacea. In clean, unencumbered prose, she unspools a story both ordinary and acute, proof that some kinds of violence are harder to name and leave no bruises, though their impressions never fade. I wish I could give this memoir to my younger self, and to all those smart, deeply feeling girls who so easily mistake intensity for intimacy. Stein's story does not simplify the romance of destructive love and assures us that if we can emerge from such trials, there is nothing to regret. Their lessons leave us more whole, not less." "Leigh Stein’s memoir is exactly what a younger generation needs—an unflinching, honest tale of loss that is devoid of platitudes. She perfectly captures the complex experience of mourning an ex-lover’s death and searching for that elusive closure we all yearn for. And beyond the details of her grief story, Leigh’s gorgeous imagery will bewitch any reader into contemplating a move to New Mexico." "In Land of Enchantment, Leigh Stein explores the landscape of her own ambivalent heart following the violent ending to the life of her mesmerizing but dangerous lover. Balancing her mature voice with the daring voice of her youth, she uncovers with wit and candor, the curious power of an erratic relationship. More than a memoir of grief, this book offers insight into an all-too-common dynamic between young men and women." "[Stein] writes beautifully and openly about what it was like to be in an abusive relationship … This well-crafted memoir easily jumps back and forth in time, never leaving the reader behind but always leaving them wanting to know more."